Hip Pocket Builders' Forum > General Forum > Model Aerodynamics > Topic: Propellors - what is the effect of changing pitch? Trying to understand prop-pitch a little better - since someone in Nijmegen suggested the blades of a plastic prop can be carefully twisted by finger at the thickest part next to the hub to marginally alter its pitch, but I've forgotten which way was suggested (increase or decrease) and why. So, taking the example of a Peanut going for maximum duration indoors, what would be the consequences of slightly increasing or decreasing prop-pitch? Re: Propellors - what is the effect of changing pitch? If you don't change the rubber motor, increasing pitch (more blade incidence) will, in general, make for a lower prop rpm and less thrust for the same turns. If the model is climbing too fast and running out of turns 'early', this may help. Less pitch will increase rpm and thrust - might be a solution if you're landing with 'too many' turns left in the motor. 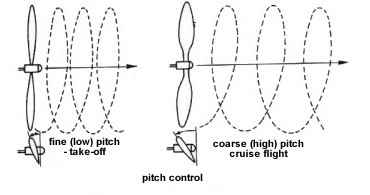 It's possible to have too low a pitch - the prop spins round and uses all the motor torque in blade drag as the model flys too fast to give the prop any 'bite'. Too much pitch and the prop tends to be 'stalled' because the model does not accelerate to sufficient speed to make the prop efficient. It's my understanding that props are most efficient with fairly high pitch to diameter ratios, like 1.5 or 2 to 1. However, with draggy models, it may be necessary to use less pitch to avoid stalling the blades. Starting at the beginning - by prop pitch we are talking about the angle that the propeller blades are mounted on the hub. Fine pitch refers to a lower angle, coarse pitch refers to a greater angle. In this case by 'more pitch' we mean coarser ie twisting the blades to a greater angle. Because the blade is twisted its convenient to ignore the actual angles and define pitch in terms of how far the prop would in theory screw itself through the air in one revolution with no slip. In other words a prop with 7" pitch would move 7" forwards in one revolution. We then get a sense of a props qualities by talking about pitch to diameter or P/D ratio. So if the above prop is 14" diameter with 7" pitch it has a P/D of 0.5 - fairly low pitch. Props for electric power tend to be around 0.5 but props for rubber power have higher P/D ratios being 'square' or 'over square' meaning P/D's of greater than 1, in other words quite a lot of pitch. Commercial plastic FF props like Peck tend to be on the lower pitch side for rubber power hence the advice to twist a bit more in. The prop blades act just like small rotating wings in the sense that they need some angle of attack on the air to make 'lift' which becomes thrust. As you can see from the picture, this angle depends on the forward speed of the aircraft and the rpm of the prop. If you increase the prop RPM you get a greater angle of attack and more thrust. But as airspeed increases the blade aoa decreases and thrust reduces. This means that for a fixed pitch prop there is a particular airspeed for best efficiency but also an 'envelope' where the prop works at all. A low pitch prop will have a limited top speed but a very high pitch prop may be very inefficient or even stalled at zero airspeed in an ROG situation and require hand launching. In rubber power we have plenty of torque available but we want to keep the RPM as low as possible because we have a finite number of turns. The lower the RPM the more duration we get from said turns. To keep the RPM down we go for the biggest diameter and highest pitch prop we can get away with... but being careful to avoid stalled blades. It also improves rubber powered duration to reduce airspeed so a lower wing loading and slower stall speed is better. Mike, Linc, Jon - thanks so much for these inputs, I now understand these basics with much more clarity. The same kind chap suggested that switching to a 6" prop and hand-launching should give greater duration. (I didn't as the ceiling in Nijmegen wasn't particularly high and I preferred therefore to use the available 'height' by sticking with my cut-down prop and flying ROG - thus gaining the 10 bonus secs as well.) This is consistent with Jon's explanation above, where increasing the pitch and/or the diameter would (within limits) increase the duration of a rubber powered model. But increasing just one or the other would increase or decrease the pitch-to-diameter ratio (greater pitch increases P/D, greater diameter reduces it). I assume that a balance is simply found in practice? 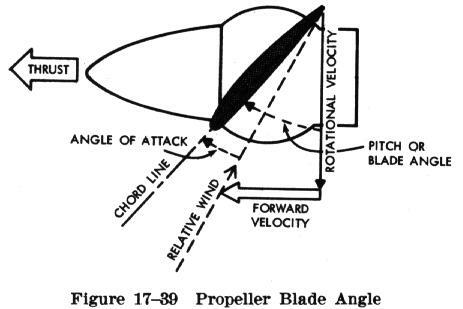 Again, trying to leave all other variables constant, what would be the effect of increasing or decreasing the chord of the prop-blades? I ask this question particularly because I notice that my smaller Gasparin CO2 motors (G24, G28, G43 etc) come with wooden props of considerably narrower chord (almost akin to that of full-size aircraft), whereas the larger motors (G63, G120, G160 etc) come with plastic props of wider chord (closer to props for rubber). What's going on here? Cheers Pete I also meant to say that Mikes post was spot on in terms of practical application. This makes sense because the energy available in the motor is fixed. Slower RPM means a longer run of slightly less 'energy' ie thrust. Where as if you speed up the RPM you have the same total energy but get more of it at a time. Rubber power is a bit like the water behind a Hydro-electric dam. You can have a small hole and a long, low powered run. Or a big hole and plenty of flow that doesn't last so long Increasing the pitch makes the hole a bit smaller. ....But increasing just one or the other would increase or decrease the pitch-to-diameter ratio (greater pitch increases P/D, greater diameter reduces it). Yes, and conversely cutting the tips off a prop will change the P/D ratio to give effectively 'more' pitch. So if you have 5.5" prop clearance, a cut down 6" will be better than a stock 5". I assume that a balance is simply found in practice? Blade chord and area is a tricky one. Roughly speaking bigger blade area (and also more blades) will absorb more power, which is better for rubber power (smaller hole in the dam). You can see also see this in practice in the big multi blade props on late version Spitfires with the same prop clearance but many more horses under the cowl. But... more blades and bigger blade areas are less efficient (blades have an aspect ratio just like wings ie thin is good) so there is an optimum. Reynolds numbers play a part too especially at lower RPM's as the bigger chord has a higher Reynolds number which helps a bit. It really is a balancing act and simply whacking a bigger blade on probably won't get you much. Increasing blade diameter is much more effective because you get to influence so much more air. This would have been a better way to get the best out of the aforementioned Spits had it not been for the practical clearance issues. Jon, thank you again for taking the time to expand on my questions so effectively! Where, by the way, can John Barker's Prop Picker spreadsheet be found? If you'd like to PM me your email address I'll send you a copy. When it comes to diameter, keep in mind that a propeller acts kind of like a fin. So a big prop up front can be destabilizing. For instance, earlier this year, a friend had given up on a peanut he had that just wouldn't fly right, no matter what. I used a smaller prop and it behaved much better right away. It's a really nice model, so I hope to see him at a contest with it. I had a nocal with a big prop which was really hard to trim. Clipping the prop tips made it settle down nicely, though I'm sure it reduced the hypothetical maximum duration. Some aircraft can get by with no vertical surfaces at all if they have a pusher prop. Or two, as in twin pushers.